← March Week 4 – Nature’s Palyful Patterns – Our Blessings! April Week 1 – Connected to the ground (past and future). Today my heart goes out to the people of Rwanda as they embark on their time of remembrance of the genocide that took place 20 years ago. Their flame of remembrance has traveled to all the districts of their country and ignited the candles erected in the communities of all their peoples. Now that flame has returned to the capital of Kigali. My image of a silhouetted woman walking Ocean Beach was for me a moment of contemplation. As the storm clouds began to break they left beautiful golden reflections on the still unsettled ocean waters. The glistening sands seemed to whisper prayers of thankfulness. Perhaps those prayers are for the empowerment of the people of Rwanda who have risen from the ashes of death to be re-birthed in the waters of their motherland, connected to the ground once soaked with the blood of their loved ones – mothers, fathers, sisters, brothers and children. How do we fully relate and connect to the lands and peoples that cover the earth? That journey offers as many paths as the number of people who take it. Capturing the essence of that journey for me, of course, involves applying every f/stop my lenses offer. 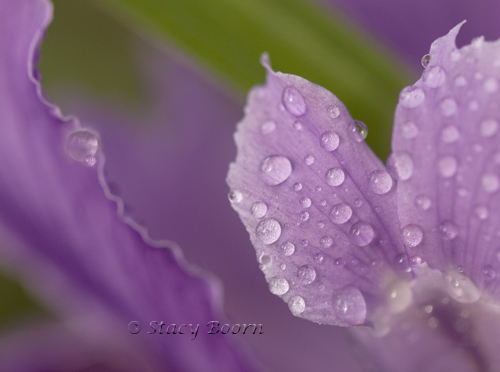 So, after and during the rains of this past week, I turned my image-making to water. The beautiful reflections of the setting sun upon the ocean waters and the minute rain droplets dotting wild irises provided sacred connections for me. Composition rules say it is not aesthetically pleasing to place a horizon line smack in the middle of an image, but I did it anyway. I kept running along until I got to a specific spot where a lone beach walker was in the right hand corner of my image. The top half is sky and the bottom half is ocean and sand which become united by the walker (or so I think). I have given you two iris images, one with enough depth-of-field to get all the petals in focus and one with a very shallow depth-of-field so that only a few of the water drops are in focus and the rest of the petals, those in the background, merge into splashes of purples. Some of you have already received my iris prayer-poem with a different photo. 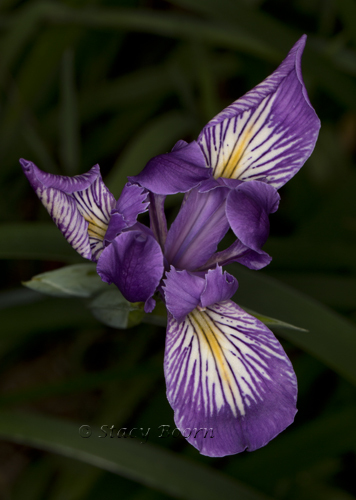 I went back to the same group of irises in the Strybing Arboretum in Golden Gate Park for the images here. This entry was posted in Weekly 2 and tagged Iris, Light of Remembrance, Ocean Beach, Reanda, Stacy Boorn. Bookmark the permalink.